Production of seedlings, especially in containers, requires simultaneous germination and emergence. Mechanical scarification often speeds up the growth of embryo axes, increases the percentage of germinating seeds and seedling emergence. Cutting off the distal ends of cotyledons is a mechanical scarification technique sometimes used in the container production of oak seedlings. However the consequences of this procedure for seedling development are little known. We wanted to determine these effects on development and metabolic changes of pedunculate oak (Quercus robur L.) seedlings. The majority of seedlings from acorns with cut cotyledons emerged two weeks earlier, more simultaneously and their total emergence (due to rejecting spoiled acorns) was ca. 20% higher. The main result is that the strong damage to cotyledons (more than one fifth of acorn mass) caused a decrease of seedling height and mass even after the second growing season. Negative consequences on seedling root/shoot ratio or on their metabolism were not observed. We conclude that this method is useful for seedling production in containers when acorn mass is reduced by one fifth. In recent years, the production of forest tree seedlings (including oaks) very often occurs in container nurseries. Production of seedlings in containers requires simultaneous germination and emergence, because if there are large differences in the time of germination, the earlier germinated plants quickly develop leaves which overshadow neighbor seedlings and restrict access to water (Suszka 2006). European oaks — pedunculate (Quercus robur L.) and sessile oak (Q. petraea (Matt.) Liebl.) — germinate unevenly under natural conditions. The difference between first and last germinating acorns can be up to a few weeks (Suszka et al. 2000). A technique that helps cause faster and more uniform germination in germination tests is to remove pericarp from the distal end of the seed (ISTA 1999). A modified version of this method—to cut off about 1/3 of the distal ends of the acorns—is sometimes used in container nurseries (Suszka 2006). It is obvious that cutting off the distal ends of acorns damages and reduces the cotyledons. However, the process of damaging the pericarp and cotyledons without lethal consequences for seedlings sometimes occurs in natural conditions too, when mice bite off parts of acorns before seed germination (Andersson and Frost 1996). In the case of Quercus suber, cotyledon damage by insects causes faster and more synchronous germination of acorns (Branco et al. 2002). Oak germinates hypogeally; the acorns remain below the ground surface and do not take part in photosynthetic activity, remaining storage organs only. The consequences of cotyledon removal just after emergence of Quercus robur seedlings are very significant for seedling growth (Garcia-Cebrian et al. 2003). The growth, maturation and flowering of some dicotyledonous grassland species is also affected by cotyledon damage (Hanley and Fegan 2007). Kennedy et al. (2004) found that seed reserves have an important effect, especially for early performance of Lithocarpus densiflora seedlings. Total nitrogen content in the first Quercus mongolica leaves declined due to cotyledon damage caused by insects (Yi and Zhang 2008). However, Suszka et al. 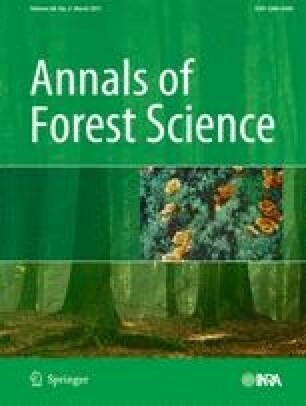 (2000), in their monograph on seeds of forest broadleaf species, state that removal of pericarp does not alter germination, emergence and development of seedlings. Valbuena and Tarrega (1998), also showed a lack of negative influence of mechanical scarification on germination of Quercus pyrenaica acorns. Therefore, the effects of cotyledon reduction on metabolic changes and development of seedlings are still not known (Giertych and Suszka 2010). The aim of this study was to determine the influence of cutting away an increasing part of the distal (cap scar) end of acorns on development metabolism of pedunculate oak seedlings. We hypothesized that a small reduction of cotyledon size will be favorable for seedlings because the reduction of cotyledon reserves will be compensated by speeding up emergence and prolonging the first growing season. Greater reduction of the acorn mass should cause a significant decrease in seedling height. We assumed that the restriction of growth will be greater for shoots of seedlings than for roots (i.e., enhanced root/shoot ratio), because the earlier developing root uses the majority of cotyledon reserves. The increasing of root/shoot ratio may decrease carbon assimilation due to decreasing area of leaf surface (Yi and Zhang 2008). We also hypothesized that the consequences of reducing cotyledons will not depend on acorn size. Acorn reduction decreases the amount of cotyledon reserves and may change seedling metabolism, especially nitrogen uptake (Villar-Salvador et al. 2010). We hypothesized that this procedure, by restriction of storage reserves within the cotyledons, causes changes in metabolism of young seedlings, and decreases the leaf and root content of carbohydrates and costly defense metabolites such as phenolic compounds. Acorns of three Polish provenances of Quercus robur (Krotoszyn 51°39’N; 17°27’E, Roszków 51°57’N; 17°26’E, Oborniki Śląskie 51°17’N; 16°54’E) were obtained from the forest storehouse in Jarocin, Poland. Mature acorns were collected in autumn 2003; they were subjected to a standard procedure of thermotherapy and fungicide — Dithane M-45, 1.5g/kg (Suszka et al. 2000). After 7 months storage (at −3°C), they were sown horizontally at 2–3cm depth (24.05.2004) individually in 2-liter pots filled with a 1:1 ratio (v/v) mixture of forest soil and peat with the addition of Osmocote® fertilizer, with a controlled release over a period of 5–6 months. Before sowing acorns were randomly assigned to five experimental treatments: 1 — untreated control, 2 — cutting off the scar of the pericarp and seed coat (DC), 3 — cutting off 1/5 of the distal end of acorns , 4 — cutting off 1/2 of the distal end of acorns , 5 — cutting off 2/3 of the distal end of acorns. Each of the five treatments had 108 acorns except the control, which had 132 acorns. The number of control acorns was greater because during preparation of other treatments we threw away all damaged acorns, and we wanted to get a similar number of seedlings for the biometrical and chemical analyses. Each acorn was weighed before and after preparation to control the mass of reduction. Two blocks were established, and pots were placed under the cover of polypropylene shade cloth, 2 m above the floor, with 50% light transmittance. The final experimental design had 18 (22 for control) acorns (replicates) for each block, provenance and experimental treatment. The seedlings were watered as necessary. During winter, the pots were covered with sawdust to protect the roots from freezing damage. The experiment was carried out in the experimental field of the Institute of Dendrology in Kórnik, Poland (52°14’N; 17°06’E; 75 m altitude). Every week, seedling emergence was noted, and the height of all seedlings was measured through the end of the first growing season. The measurements of height started 6 weeks after sowing, when almost all seedlings had emerged. In August and October of the first growing season and October of the second growing season, 60 seedlings (four from each provenance and preparation treatment) were randomly chosen for morphological and chemical analyses. After rinsing the roots, each seedling was divided into: main root, fine roots (<2 mm), stem, and leaves. All parts of seedlings were oven-dried (65°C for 48 h), powdered in a Mikro-Feinmühle Culattimill (IKA Labortechnik Staufen, Germany) and stored in plastic boxes. Nitrogen (N) and carbon (C) concentration in the leaves and roots were measured using the Elemental Combustion System CHNS-O (Constech Analytical Technologies Inc., Valencia, CA, USA). The concentration of phenolic compounds (TPh) was measured colorimetrically using Folin and Ciocalteu’s Phenol Reagent (SIGMA F-9252), following Johnson and Schaal (1957) as modified by Singleton and Rossi (1965). The content of total phenols was expressed in μmol of chlorogenic acid g-1 dry mass. Total soluble carbohydrates and starch concentrations were determined by a modification of the method described by Hansen and Møller (1975) and Haissig and Dickson (1979). Sugars were extracted from the tissue powder in methanol–chloroform–water, and tissue residuals were used for starch content determination. where Y is the total % of seedling emergence, a the asymptotic value for the function, b, c and d the shape parameters for the function, and x the number of days after sowing when the last measurement was made. Mean absolute emergence rate (G; % day-1) over the whole period was calculated using parameters derived from a fitted Richards function. Analysis of variance (ANOVA) was used to assess the influence of provenance and preparation treatment on seedling height, leaf, shoot and root mass, leaf and root TPh, carbohydrates, N and C concentration. We did not observe any (except leaf nitrogen at the end of the first growing season) significant influence of provenance on the studied parameters, and we did not describe these results (see Appendices 1 and 2). The results expressed as percentages were arcsin transformed for analyses by ANOVA. The post hoc Tukey test was used to assess the differences among treatments. Normality of the distribution was tested using Shapiro–Wilk statistics. Linear regression analyses were done to estimate the consequence acorn size on seedling height for all experimental treatments. All analyses were conducted with JMP software (version 7.0.2; SAS Institute Inc., Cary, NC, USA). The reduction of acorn cotyledons caused faster and more uniform seedling emergence (Fig. 1). The damaged acorns (DC; 1/5; 1/2; 2/3 treatments) emerged significantly (χ2=22.0; p < 0.002) better (83–88%) than the controls (68%). The first seedlings from acorns with cut cotyledons (1/5; 1/2; 2/3 treatments) emerged 2 weeks after sowing. The majority of seedlings emerged nearly simultaneously, during 2 weeks between 17 and 30 days after sowing (Fig. 2). After 7 weeks, almost 80% emergence was observed. The first seedlings from DC and the control treatment also started emergence 2 weeks after sowing; however, the emergence rate of the majority of seedlings was longer and lasted 17 and 21 days for DC and control treatments, respectively. After 2 months, 50% of control seedlings emerged, and the last seedlings started emergence even after 10 weeks (Fig. 1). Seedlings from all treatments ceased to grow at almost the same time (end of August), between the 240th and 248th day of the year, ca. 100 days after sowing (Fig. 3). In spite of the shorter duration of their growing season, the seedlings from DC and control treatments achieved a greater height (Figs. 3 and 4). The seedlings were significantly lower when the reduction of the acorn mass was 1/2 or 2/3. The cutting of acorns also alters the mass of seedlings and their parts. The effects of acorn reduction were evident at the end of the second growing season (Fig. 5). Significantly lower dry leaf mass of seedlings from the 1/2 and 2/3 treatments was found only when they were harvested at the end of August of the first year (Fig.5b). In the cases of shoot and root mass, significant consequences of acorn reduction were evident at the end of the second growing season (Fig. 5c,d). The influence of this procedure on the shoots and the roots of seedlings was similar and we did not find changes in the root/shoot mass ratio. The seedling height at the end of the first growing season significantly depended on the size of acorns (Fig. 6); however, for higher levels of damage (1/2; 2/3 treatments) we did not observe this relationship. The influence of acorn reduction on nitrogen and carbon levels in the leaves and roots was not significant. The mean content of nitrogen and carbon stayed within the normal range for oak seedlings — leaf N 2.48(0.46); root N 2.06(0.41); leaf C 47.27(1.84); 45.3(3.53) — (all data for elements and carbohydrates are given in percentage of dry weight with SD in parenthesis). Among experimental variables only the date of harvest had a significant influence on the level of leaf nitrogen (lower at the end of the growing season) and root nitrogen and carbon (higher at the end of growing season). Cotyledon reduction did not alter levels of carbohydrate and phenolic compounds in oak seedlings. Content of soluble carbohydrates in the leaves 6.3(1.8) and roots 4.7(1.9) was typical for oak seedlings and significantly increased at the end of the first growing season. Starch content in the roots was higher 3.6 (4.4) than in the leaves 0.6(0.3) but we did not observe differences among the sampling dates. The level of phenolic compounds in leaves and roots was very similar, 243.6(57) μmol d.wt and 247.8(64.2) μmol respectively. At the end of the growing season, we noted a significant 20% increase of phenolic compounds only in the roots. As we expected, seedlings from the damaged acorns emerged earlier than those from controls. A similar reaction from simulated seed predation was described by Vallejo-Marin et al. (2006) for some neotropical rain forest tree species. Suszka (2006) also mentioned that similar effects were caused by cutting off about 1/3 of the distal ends of acorns. This meets the expectations of seedling producers, especially when the seedlings are cultivated in container nurseries. In the literature there is still a lack of information about consequences of this procedure for seedling development, because the previous studies on simulated seed damage dealt mainly with seed germination or emergence rate. The reason for faster germination of damaged acorns is unknown. According to (Finch-Savage and Clay 1994), mature acorns require a supply of external water to split the pericarp and begin radicle extension, so this procedure probably allows faster penetration of water into the seed. A second explanation for faster germination of damaged acorns is increased levels of plant growth regulators connected with germination, particularly IAA — indoleacetic acid (Finch-Savage and Farrant 1997; Prewein et al. 2006). The increase of IAA in cotyledons may be connected with better water supply; a similar phenomenon has been observed in coffee flower buds soon after plants were released from water stress (Schuch et al. 1994). The procedure (removing part of the tips of acorns) studied here takes advantage of the natural ability of oak seeds to tolerate small levels of damage. Oaks are zoochoric species and acorns are dispersed and very often partially damaged by rodents, squirrels and birds. The jay (Garrulus glandarius L.) hoards and hides acorns in the ground in the autumn, and in the spring it locates young seedlings and removes and eats cotyledons (Ouden et al. 2005; Sonesson 1994). The removal of cotyledons 3 weeks after emergence did not influence the mass and height of Quercus robur seedlings (Andersson and Frost 1996). However, significant consequences of cotyledon removal on seedling mass were observed when the cotyledons were removed during the first 2 weeks after emergence (Garcia-Cebrian et al. 2003). Our results show that the degree of acorn damage is very important. Cutting off 1/5 of the distal end of acorns caused over 10% reduction of seedling height after the first growing season, and reduction of height after the second year was not significant. However, higher damage (1/2 or 2/3 acorn mass) caused significant reductions in first and second year heights, 32% and 45% respectively. The reduction of seedling heights after insect damage of Quercus suber acorns was noted also by Branco et al. (2002). However, in the case of the large-seeded tropical species Gaustavia superba, tolerance of partial (even 50%) damage caused by simulating insect attacks has been shown (Dalling and Harms 1999). Results of our experiment and literature data suggest that the amount of reserve substances in oak cotyledons is greater than the needs of young seedlings if they grow under optimal conditions. This extra investment of parental resources in the progeny is due to better seed dispersion. According to Gomez et al (2008) heavier acorns were dispersed further, and were more likely to be cached and survive than lighter acorns. The loss of small parts of cotyledons, or their removal a few weeks after germination, does not have negative consequences for seedling development. In oaks, the roots start to develop first and the epicotyls 20 days later (Suszka et al. 2000). We hypothesized that at the end of the growing season the shoots of seedlings will be more restricted than roots when a larger part of the cotyledons is damaged, because the root will use up the majority of reserve substances from the cotyledons. However, the root/shoot mass ratio did not differ among the treatments. Removal of cotyledons 1 week after emergence also did not influence these proportions (Sonesson 1994); this means that cutting of a small part or removal of cotyledons at that time does not influence shoot development more, as we had assumed. In many tree species, initial seedling growth is positively correlated with seed mass (Howe and Richter 1982; Vaughton and Ramsey 1998; Sousa et al. 2003; Kennedy et al. 2004), and this is also true in oak species (Merouani et al. 2001; Grossman et al. 2003). Furthermore, larger oak acorns have a higher germination rate (Gomez 2004; Tilki 2010). In our experiment the second relationship did not exist, and the first was significant only for controls and slightly damaged acorns. Bigger seedlings grew from heavier acorns. However, the height of seedlings from strongly damaged acorns (1/2; 2/3 treatments) did not depend on the initial acorn mass (Fig. 6). We do not know why the growth reduction of young seedlings caused by cutting off the distal ends of acorns is greater for bigger acorns. This may be connected with the unequal distribution of metabolites in the cotyledons. Steele et al. (1993) concluded that the content of tannins differed significantly between basal and distal parts of acorns, and it was higher near the embryo axis to protect it from predators (rodents or birds) and insects. It is also probable that storage metabolites in oak cotyledons are unequally distributed, although we had no evidence that heavier acorns have more reserves in the distal portion. Other explanations for this result may be connected with the surface area of the cut, which was greater in bigger acorns. This could cause more desiccation of sensitive cotyledons, and could change the water potential gradient driving water flow to the axis from the cotyledons (Finch-Savage and Clay 1994). These results did not confirm our initial hypothesis that consequences of reducing acorns do not depend on their size. Reduction of storage substances (Bonfil 1998; Garcia-Cebrian et al. 2003) and nutrients (Milberg and Lamont 1997) in cotyledons can alter the survival and development of seedlings. Kennedy et al. (2004) demonstrated that the amount of seed reserves, as well as the removal of cotyledons, significantly influenced photosynthesis and carbon management in very young Lithocarpus densiflora seedlings. There is a lack of information in the literature on oak seedling physiology and metabolism after cotyledons are damaged. Our results showed that after cutting the distal end of cotyledons, the level of carbohydrates, total soluble phenolic compounds, and the content of the main elements carbon and nitrogen in leaves or roots of the young seedlings, were not affected at the end of the growing season. Carbon supplies from cotyledons and other carbohydrate reserves in some tropical tree species enhanced the ability of seedlings to cope with herbivores and disease (Kitajima 2003). The lack of significant changes we observed in levels of the main metabolites is very advantageous for seedling producers, because the seedlings from damaged acorns would have an ability to defend themselves against herbivores and diseases similar to that of the controls. Changes in the content of nitrogen, carbon, and phenolic compounds in leaves and roots observed during growth were connected with physiological senescence. The method of acorn damage before sowing has both advantages and disadvantages. Significant acceleration and simultaneous emergence of seedlings are advantages. In the case of container production of oak seedlings, this allows use of the same space in the greenhouses more than once during one season. The next advantage is the ca. 20% better seedling emergence caused by rejecting spoiled acorns when the distal ends are cut off. The seedlings obtained have appropriate proportions between the roots and shoots, but they are somewhat shorter, and in the case of large reductions (2/3 of acorn mass) as much as 45% shorter. The disadvantage of this method is that the acorn reduction must be performed manually. On the basis of our results we can say that only a small reduction of acorns (max. 1/5 acorn mass) would be optimal for seedling producers. We gratefully thank Ms. Alicja Bukowska, Ms. Ewa Mąderek and Ms. Anna Nowak for their help with the chemical analysis. We are grateful to Dr. Lee Frelich from University of Minnesota for correcting language in the final version of the manuscript, and thank three anonymous reviewers for useful comments and suggestions. This study was supported by Institute of Dendrology Polish Academy of Sciences.